The creative and ultra-luxurious earrings designed by Stephen Webster will capture your heart. Sensuous, expertly crafted and highly detailed, the unique, edgy pieces include chandelier, drop, hoop and stud styles. Check out unique, edgy ear cuffs and ear jackets from the Superstone and Superstud collections. 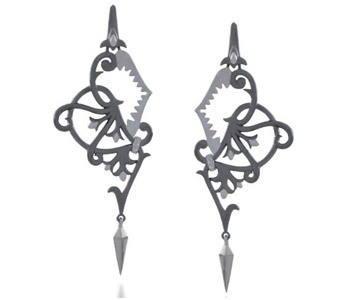 Marvel at a pair of detachable Thorn earrings embellished with black and white diamonds. Let your style soar with 18kt yellow gold wings with diamonds. Barb stud earrings from the Forget Me Knot collection are available in silver and black rhodium. White gold and diamond chandelier earrings from the Jewels Verne collection capture the light and a lot of attention. You can also color your world with multi-gemstone earrings in the Goldstruck collection, including amethyst, tanzanite, blue topaz and quartz turquoise. Dress your ears up today with a beautiful pair of Stephen Webster earrings.